Gettysburg is a 1993 American epic war film written and directed by Ronald F. Maxwell, adapted from the historical novel The Killer Angels (1974) by Michael Shaara, about the Battle of Gettysburg during the American Civil War. The film stars Tom Berenger, Jeff Daniels, and Martin Sheen; its score was composed by Randy Edelman. The film follows the plot line of Killer Angels. The focus on the first day is on John Buford, who selects the battlefield. The focus on the second day is Joshua Chamberlain's defense of Little Round Top. The focus on the following evening is on preparation for and the execution of Pickett's Charge. James Longstreet is the major focus of those scenes. George Lazenby as General J. Johnston Pettigrew. Civil War buff Ted Turner has a cameo appearance in one of the battle scenes as Colonel Waller T. Patton. During Major General Pickett's (Stephen Lang) charge, some Confederate troops come to a fence that they have to climb over. Turner plays the Confederate officer who leads the charge, then gets shot down. Other cameo appearances include Ken Burns, who wrote and directed the epic PBS documentary, The Civil War (1990), portraying an aide to Major General Hancock during Pickett's Charge. Civil War historian Brian Pohanka has an uncredited cameo appearance as Union general Alexander S. Webb. The producers originally pitched the project to ABC in 1991, as a TV miniseries. ABC initially agreed to back the project, but when a miniseries about George Armstrong Custer, Son of the Morning Star (1991), got low ratings, ABC pulled out. Shortly thereafter, media mogul Ted Turner picked it up, and the film went into production. The soundtrack was composed by Randy Edelman. Two more soundtracks, More Songs and Music From Gettysburg and a Deluxe Commemorative Edition, were released as well. The first one included popular songs from the time period and a recitation of the Gettysburg Address by Jeff Daniels, while the second included several previously unreleased tracks from the score. A prequel film, Gods and Generals (2003), based on the eponymous 1996 prequel novel to The Killer Angels by Shaara's son, Jeff Shaara, depicts events that take place prior to those shown in Gettysburg, with several actors reprising their roles. It was also directed by Maxwell. ↑ Jubera, Drew (October 9, 1993). "GETTYSBURG: Ted Turner, a cast of thousands and the ghosts of the past". Baltimore Sun. Tribune Company. Retrieved October 12, 2011. 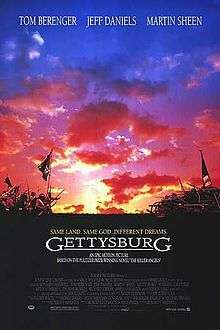 ↑ "Gettysburg (1993) - Box Office Mojo". 1 2 "Gettysburg". Turner Classic Movies. Retrieved June 17, 2016. ↑ Shaara, Michael (1987). The Killer Angels: The Classic Novel of the Civil War (Civil War Trilogy). New York City: Ballantine Books. ISBN 978-0345348104. ↑ "Gettysburg". 8 October 1993.